This Winholt SN-2618 gray lug is an excellent choice for transporting and storing warm or cold food, prep tools, or a wide variety of other products! 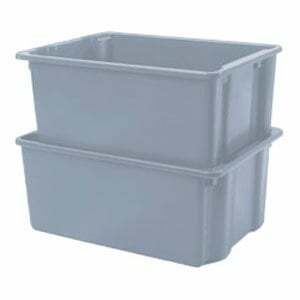 Made from durable polyethylene, this tub's uniform thickness provides maximum strength and protection of your goods while built-in rim handles make transportation a breeze. Purchased these a mixing tubs for use in food prep. Solid and heavy construction hold up very well to repeated abuse and constant use. No real negatives that come to mind. These boxes are great for keeping dry storage in. You can place different types of potatoes or different kinds of onions in there as well. Super easy to clean.